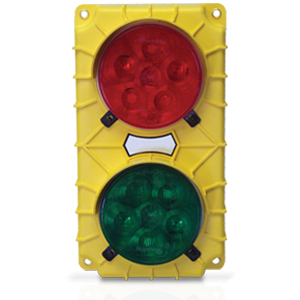 Loading Dock Stop & Go Communication Lights are designed to improve the safety of your loading dock and personnel by informing truck drivers, forklift drivers and other loading dock personnel the status of loading and/or unloading operations taking place at the loading dock. They help to prevent accidents and mishaps, which can lead to injuries, by managing loading dock traffic flow and preventing unscheduled truck departures and trailer entries. They do this by informing truck drivers and loading dock personnel of the status of loading or unloading operations taking place at the dock. They are installed both inside and outside the building at each loading dock bay opening. Outside Truck Drivers - the red light warns the truck drivers not to pull away from the dock, while the green light lets them know that loading and/or unloading is completed and it is safe to pull away from the loading dock. Inside Personnel - the red light warns the forklift driver and other personnel to stay clear of the truck as it is pulling up to and/or pulling away from the loading dock. The green, light on the other hand, lets them know it is safe for them to enter the back of the truck trailer. Red and green, highly visible warning lights advising driver of safe / unsafe, park/depart conditions. Energy efficient, maintenance-free, long lasting LED exterior lights that use 5-10% the energy of an incandescent bulb.